We are building a new web site! Pages are being added, so check back often. 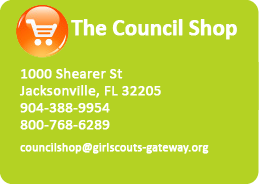 If you don�t find what you need here, please contact your membership specialist (for members) or email info@girlscouts-gateway.org - Thank you for your patience! Discover the fun, friendship, and power of girls together. Girl Scouts of Gateway Council, Inc. serves approximately 25,448 girls and adults in 16 north Florida counties, from the Gulf of Mexico to the Atlantic Ocean. Girl Scouts provides an accepting and nurturing environment where, in partnership with committed adults, girls develop assets that will serve them all their lives: leadership, decision-making skills, and social conscience. Through activities that are fun and personally challenging, girls develop self-esteem based on achievement.